Since the launch of Wiki Loves Women in January 2016, the project has caused quite a stir. On this page you can see why other people, including some of our partners, think that Wiki Loves Women is a valuable project … So, don’t take our word for it, listen to other people here! 3 Sat Kulturzeitbericht from Wednesday, 8th March 2017. Director Tim Lienhard. Engr. 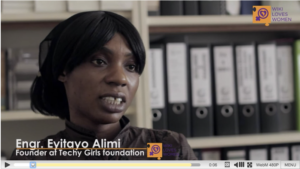 Eyitayo Alimi the founder of Techy Girls Foundation, Nigeria, in a video documentary to commemorate International World Women’s Day 2017. Director and producer Ema Edosio. 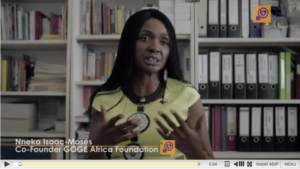 Nneka Isaac-Moses, co-founder of the GOGE Africa Foundation, Nigeria, in a documentary organized to commemorate International World Women’s Day 2017. Director and producer Ema Edosio. 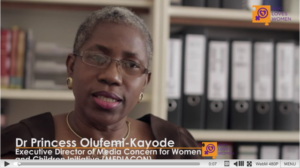 Dr Princess Olufemi-Kayode, Executive Director of Media Concern for Women and Children Initiative (MediaCON), Nigeria, in a documentary to commemorate International Women’s Day 2017. Director and producer Ema Edosio. 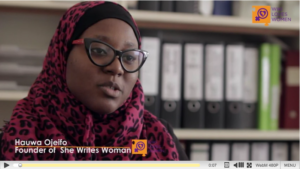 Hauwa Ojeifo, founder of She Writes Women, Nigeria, in a documentary organised to commemorate International Women’s Day 2017. Director and producer Ema Edosio. 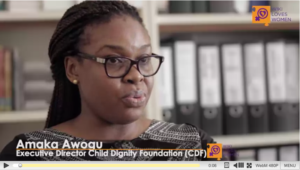 Amaka Awogu, executive director of Child Dignity Foundation (CDF), Nigeria, in a documentary organised to commemorate International Women’s Day 2017. Director and producer Ema Edosio.